The New School For Jazz and Contemporary Music’s Improv Ensemble, directed by famed bassist and Jazz faculty member Reggie Workman, performed live at WBGO Jazz the week of April 15th. It was part of a series of student broadcasts the New Jersey-based jazz radio station is airing for Jazz Appreciation Month. 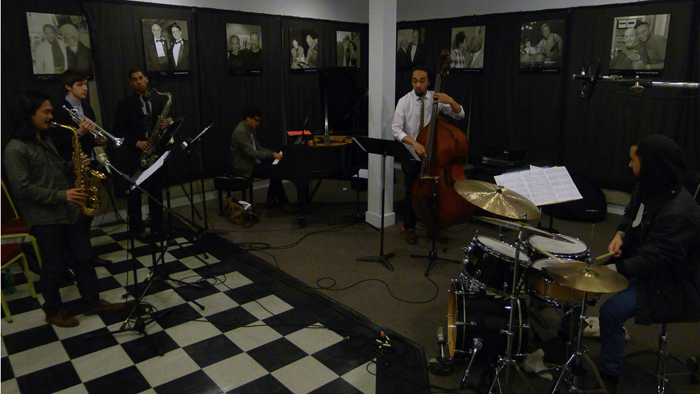 The ensemble, made up of Jordan Carrington on piano, Albert Baliwas on alto sax, Devin Starks on bass, Benjamin Katz on tenor sax, Francesco Alessi on drums and Sam Neufeld on trumpet, played original compositions and others, including jazz classics by Charles Mingus. The group earned high praise for their musicality from veteran host Michael Bourne. To listen to the concert in full, click here.